I'm using Twines2 with sugarcube to create a RPG game and I want to set all my stats of characters in one passage like this. 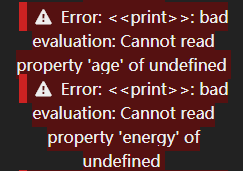 But Twine can't read my definations and display this. Please tell me how to correct it.